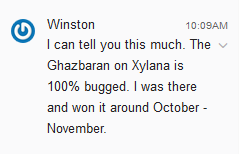 Seems like there is an issue with Xylana's bosses in general, it did not pick up Ferumbras a while ago, now Ghazbaran spawned at 10.11.2016 and it did not pick it up and it says Orshabaal can spawn in 2 days but it just spawned a few minutes ago (154 days after last one). Thanks for info. Ferumbras should be fixed, I will check what could be wrong with Orshabaal.